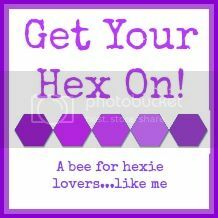 My friend Stacey at the Tilted Quilt is currently looking for members for a second Bee Hive of the "Get Your Hex On" bee. It's a 12-month bee - all hexagons, all the time. If you're interested, head over to her site to read more about it and to sign up if you're so inclined. I myself am in the first hive, and am loving it! Thanks to Stacey for organizing this bee - so far, it's been wonderful!